TACTICAL BASE GAMBERI, Afghanistan — Deep in the mountains of eastern Afghanistan, on the front lines against Taliban and Islamic State fighters, U.S. military commanders say they needs more forces to better train Afghan soldiers to combat the escalating threat. President Donald Trump declared Monday he'd augment troop levels, but wouldn't say by how much. At Tactical Base Gamberi, the Americans helping Afghan army units try to quell the insurgent stronghold of Nangarhar province want to put more advisory teams into the field. They believe expanding the training can make the Afghans more capable of taking on the enemy alone. 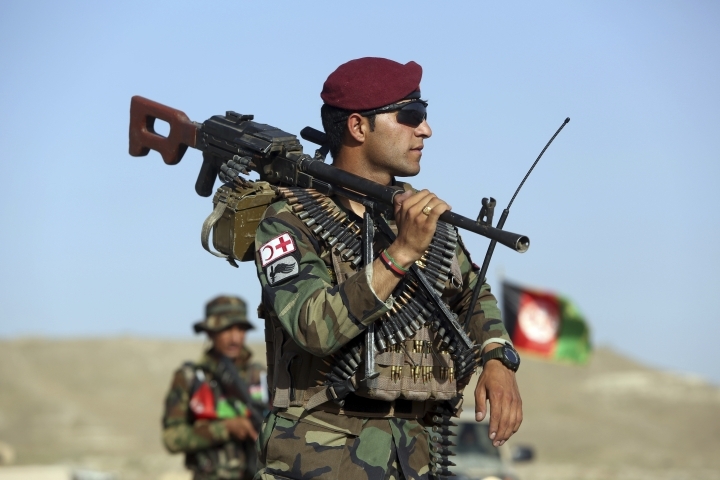 "We need guardian angels," said Lt. Col. John Sandor, deputy senior adviser for the Afghan Army's 201st Corps, referring to security forces that would protect U.S. training teams so they can work alongside Afghan brigades. Senior military officials have been discussing such deficiencies for months. In February, the top U.S. commander in the country told Congress he needs "a few thousand" more troops. The Pentagon has asked for Trump's approval of a nearly 4,000 troop increase as part of the broader new strategy. Trump already had given military leaders greater authority to manage America's military efforts. But his new Afghan strategy had been held up for months amid a contentious review process that has included the president publicly voicing his dissatisfaction with the options. He finally outlined his plan in a primetime television address Monday, signaling more U.S. and NATO forces were coming, but no indication of the scale or how long they'd be deployed. "We will not talk about numbers of troops or our plans for further military activities," Trump said. "Conditions on the ground, not arbitrary timetables, will guide our strategy from now on. America's enemies must never know our plans or believe they can wait us out." Thousands of miles away, in a sparse, wood-paneled room at the Gamberi training base, Sandor and others outlined the training restrictions they currently face. In two nearby provinces, for example, Afghan units were conducting training without American advisers to oversee the instruction and make sure they are learning the best combat tactics. But in other cases, the lack of American support means Afghan units are reluctant to go out on their own. Sometimes, said Maj. Richard Anderson, operations adviser for 201st Corps, the Afghan answer is: "Let the Americans do it." In early spring, when U.S. forces asked the Afghan army to step up its pursuit of IS militants in Nangarhar province, they encountered resistance. Demoralized by an IS attack that killed 16 Afghan soldiers in April, Afghan commanders wanted the American and Afghan special operations forces to carry the fight. But ground units are needed to hold territory, so U.S. advisers were forced to spend weeks cajoling the Afghan Army to join the battle. Ultimately, they did. But U.S. military officials say such episodes underscore the need for more advisers, and as a result, more troops to protect them as they move into places like Nangarhar, an IS stronghold and notoriously difficult fighting arena. The province is home to Tora Bora, a network of caves where Osama bin Laden and other al-Qaida militants eluded capture and survived a massive American bombing campaign early in the war. Without the enhanced training that additional forces would make possible, Sandor said, "it's hard to turn the corner and make them better." The advisers, however, also point to progress. In January, Afghan forces trying to resupply troops to the north would only go out with U.S. aircraft and escorts. A month later, with training and encouragement, the Afghans were using their own gunships and artillery support on the supply runs, with no U.S. assistance. "We took them from 'we can help, but if we do it, you'll never figure it out,'" said Maj. Richard Anderson, operations adviser for 201st corps. "At times it seems like a drag is there, but once you get them to the point ... they can do it." The top Afghan commander at Gamberi credits the advisers with increasing his corps' readiness. "I want to have enough equipment and advisers to keep my troops equipped, and help against the enemy," said Lt. Gen. Mohammad Zaman Waziri, 201st Corps commander. More advisors, he added, could help the corps get light and heavy weapons and the training needed to use them, "because the enemy has a lot of capability and has not weakened as much as we would want them to." Like many Afghan commanders, Waziri would like even more. He recalls the time before the Obama administration scaled back operations, when U.S. troops fought with Afghans and provided far more air support. He'd like such support again. Waziri said his troops were thrilled when the U.S. dropped the Massive Ordnance Air Blast bomb, or MOAB, on IS insurgents in Nangarhar province in April. It was the first time the largest non-nuclear bomb was ever dropped in combat, and Afghans estimated nearly 100 killed. "If there is any bigger bomb than MOAB they should drop that, too," he said.